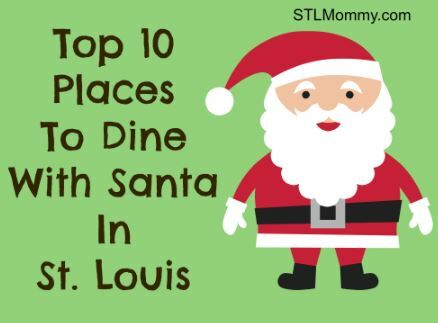 Wondering where you can take the kids to dine with Santa? Look no further because here’s a fun top 10 List you’re sure to enjoy! Santa Claus is hosting a breakfast at Eckert’s, and you and your family are invited to our wonderful Breakfast with Santa event. Around here, Santa is the ultimate VIP and not just because he wears that snazzy red suit. We enjoy his upbeat attitude and cheerful disposition, and we welcome you to come and see him for yourself, creating cherished memories as you enjoy our delicious breakfast menu favorites. Be sure to stop by to catch Santa before he leaves for his busy North Pole workshop. Reservations are highly recommended. You can make your reservation for Breakfast with Santa or even Dinnertime with Santa online! Register early for Breakfast with Santa at The Magic House, December 2nd or December 9th. Make your morning (or evening) sizzle with a yummy pancake breakfast with Santa. Enjoy a fun holiday craft to take home, all-day admission to The Magic House and the chance for little ones to sit on Santa’s lap. It’s sure to “stack” up to your expectations! Reservations required. Bring the whole family for a festive holiday experience at the Zoo. Your joeys will jump for joy as they meet Santa and his holiday helpers, and you’ll be in a merry mood with complimentary parking and a delicious meal. Reservations are limited, so reserve your spot soon! Saturday, December 1: 9:00 a.m. & 11:00 a.m.
Sunday, December 2: 9:00 a.m. & 11:00 a.m.
Saturday, December 8: 9:00 a.m. (SOLD OUT) & 11:00 a.m.
Sunday, December 9: 9:00 a.m. & 11:00 a.m.
Saturday, December 15: 9:00 a.m. & 11:00 a.m.
Sunday, December 16: 9:00 a.m. & 11:00 a.m. This will sell out FAST so hurry over to make your reservations. Do you love pancakes and do you love Santa? If you do, bring your appetite to the Visitors Center in Forest Park on Saturday, December 1, 2018 for a FUN-raiser for Forest Park Forever! Santa will be on hand to hear your holiday wishes while you feast on pancakes and scrambled eggs. last seating at 11 AM. Be sure to purchase your tickets for the designated seating time you desire. Tickets will only be honored for the seating time chosen. Tickets are $15.00 for children 12 years or younger, $20.00 for all others. NO dogs or photos—Santa will walk around and visit with everyone. Check back for more details or to register now call the Arnold Recreation Center at 636-282-2380. Santa can’t live off just cookies and milk, he has to eat breakfast, too! Good little boys and girls (ages 2-8) are invited to have Breakfast with Santa on Saturday, Dec. 8, 2018, at St. Peters Rec-Plex South. Doors open at 8:30 a.m. with the continental breakfast starting at 9 a.m. Santa will be around for crafts and a sing-along of popular Christmas songs until 10:30 a.m. Parents and grandparents, don’t forget to bring a camera to get some memorable photos with Santa! The cost for the event is $14 per child and $7 per adult. Advance registration is required by Dec. 4. Register online at www.stpetersmo.net/rec-connect, call 636-939-2386 ext. 1400 or sign up in person at St. Peters Rec-Plex, 5200 Mexico Road. At the Y we value traditions and family time, so come enjoy a special morning with your favorite jolly old elf! Families will enjoy a hot breakfast, a holiday craft and time to share your wishes with Santa and Mrs. Claus. Don’t forget your cameras! Big thanks to FirstWatch® for providing breakfast!! Cost: $8 per person. Kids under 2yrs are free. Space is limited. Santa is coming to town, and we are wanting to spread the holiday magic throughout our hotel. So join us for a morning spent with Santa while indulging in our hot breakfast buffet, which includes a made to order omelet station. Everyone will get the chance to meet Santa and give him their own Christmas list or letter, and the option of taking their own photos. There will be plenty of activities to keep the kids entertained for a fun-filled morning with Santa. Santa comes but once a year and seats are filling up fast so get your tickets while they last! The Wildwood Hotel is located in an affluent neighborhood right outside of St. Louis. Our boutique hotel is the perfect setting for you and your family to enjoy a morning with Santa. Santa Claus is coming to town! Join us for a jolly good time at our annual Breakfast with Santa event! Enjoy a delicious hot breakfast and some festive crafts. Each child will have the opportunity to get their photo taken with Santa too, so don’t forget your camera! All attending must pay (2 and under is free). Don’t miss the St. Louis Holiday Lights and Activities List for more fun things to do this holiday season.